Typically, suburban areas in the United States are exclusively oriented to automobile travel. Most suburbs do not accommodate bicyclists and pedestrians, and they rarely provide good access to transit (with a few exceptions). With all this in mind, however, it is necessary to expand walking and bicycling travel opportunities in the suburbs without eliminating the car. Suburbs were organized around automobile travel and, in many instances, will not function well without it. This session explores methods of redesigning suburban communities to better accommodate nonmotorized transportation. It discusses how the suburbs developed, the hierarchy of the street system, and appropriate modifications that can accommodate and encourage bicycling and walking. It includes a discussion of Safe Routes to Schools programs, and how they can be utilized to focus attention on pedestrian conditions within suburban neighborhoods. This session is mostly oriented toward suburban planning considerations—with references to other sections that focus on design issues such as traffic calming and walkway/bikeway design. Before the automobile became a part of most American households, city dwellers relied on walking for their transportation close to home and on streetcars, trolleys, or trains for longer trips. The streetcar and railroad lines generally ran from cities to outlying neighborhoods where houses and businesses clustered near major stops. People usually walked from their homes to public transportation, much as they walked from home to the business district to do their shopping. As more and more people were able to afford their own cars, dependence on streetcars, trolleys, and trains diminished as did the need to live near them. Since land farther away from the city was less expensive, people from city neighborhoods began to see the fulfillment of a dream to own a detached home with land around it. 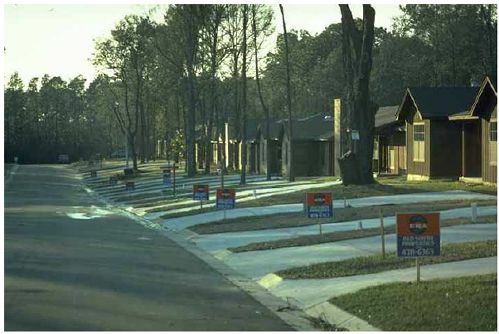 When developers of these homes learned that people would be willing to drive a little farther to buy even less expensive land, leapfrogging began. Leapfrogging is the practice of developing less expensive land farther from the city while leaving vacant more expensive land closer to the city. Developers of schools, businesses, and parks also sought the least expensive land. Thus, the result was scattered facilities and communities with no central focus. Because suburban building became so scattered, streetcar and rail transit were less cost–effective, ending usually at the city’s edge, and the car became the main means of transportation for suburban residents. That suburban activities require the use of a car and generate a large amount of traffic is well known. In suburban commercial areas, heavy traffic starts early in the morning and lasts for the entire day until beyond the end of evening rush hour. Traffic is heavy because of the many trips from store to store made by shoppers who find driving between stores easier than walking or bicycling, even though distances may be short enough for these activities. Because of the active, internally generated traffic, walking, and bicycling are not safe, pleasurable, or convenient. Consequently, before viable pedestrian improvements can be made, all–day peak traffic must be corrected. The land use changes needed to remedy these conditions include increasing density and mixing land use, two actions residents of suburbs often believe are inappropriate for suburban lifestyles. Many communities have already begun to alter land regulations to prevent suburban sprawl. Apartments and commercial developments are now being built along arterials and on land bypassed by leapfrogging. The pattern of development in many suburbs is infilling. This present pattern of infill development is providing more opportunities for design to accommodate pedestrians and bicyclists and to promote bus transportation. In some regions where approaches to land use are not consistent between neighboring cities or counties, development may be concentrated in those jurisdictions with the least strict land use control. This development leads to megaleapfrogging, a good reason to promote land use controls on a regional basis. Here, three typical pedestrian problems—safety, function, and comfort—should be addressed. Safety problems are real or perceived conflicts as people cross streets or walk where there are no sidewalks. Since suburban drivers cover longer distances and drive faster, the dangers to pedestrians become magnified. The absence of pedestrians on suburban streets dulls drivers’ awareness and further aggravates the problem of safety. Functional pedestrian problems are found wherever there is little or no walking space, a lack of sidewalks, parked cars along the road’s edge, wide driveways, few benches, and barriers (see figures 7–1 and 7–2). Beyond this, another functional problem is the lack of destinations within reasonable walking distance. Finally, problems that create uncomfortable environments for pedestrians and bicyclists are: walking next to noisy, fast moving cars; poor vistas; few rest stops; streetscapes with little interest to someone who is not driving; and vacant lots or large parking lots that are visually dull and potentially unsafe. Figure 7–1. Photo. 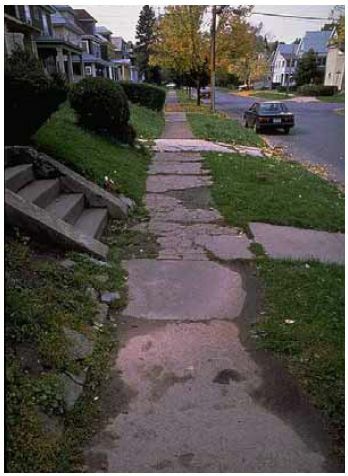 Inadequate maintenance of sidewalks makes a short walk difficult to maneuver. Figure 7–2. Photo. Parked cars and a lack of sidewalks along the road’s edge create unsafe conditions for bicyclists and pedestrians. The long driving distances necessary to serve low–density areas increase the speed and volume of suburban traffic, making streets dangerous and uncomfortable places (see figure 7–3). To counter this discomfort, an inside–out development pattern—the opposite of the prevalent urban development patterns—has evolved. While most urban communities focus on and utilize the street, suburban communities turn their backs to the street, and focus human activities on internal gardens, courtyards, and other private or internal, if open, spaces. Typically, car parking distances front doors from the sidewalk, and makes using the car seem most natural. Unfortunately, the internal spaces are seldom interconnected, so walking or bicycling for long distances through or between them is not often possible. Figure 7–3. Photo. Sidewalks with a landscape strip should be installed to minimize exposure to vehicular traffic. A shift has occurred from the urban grid pattern to a suburban road hierarchy. The grid typical of many cities allows free choice of routes but does not necessarily distinguish between high or low volumes of traffic or between streets that may or may not be good locations for raising families. With its system of roads, from arterials carrying high traffic volumes to cul–de–sacs with virtually no vehicular traffic, the suburban hierarchy changed all that. The secret of the hierarchy lay in not interconnecting streets, which positively directed through traffic to arterials. This made cul–de–sacs the preferred residential streets. Grid patterns developed when travel by foot was important. As the grid was infinitely divisible, it created a fine–grained network that benefited foot traffic. The hierarchy developed to accommodate the automobile by recognizing that cars can easily travel extra distances—as traffic disperses, certain roads should carry more or less traffic than others. Pedestrians, unfortunately, cannot easily travel longer distances, and are the losers. In its conceptual form, the hierarchy includes a separate and internal pedestrian system that purportedly ensures pedestrian access to different parts of the community. Unfortunately, these internal systems were not provided in most cases, and where they were, they did not lead to places people wanted to reach because those were located on the roads. Internal circulation spaces were often unsafe because they lacked foot traffic and the varied ownership made access dependent on private property rights. Remedying these conditions requires a strategy of: linking internal spaces where possible and making the street usable for pedestrians and bicyclists will enhance suburban living for many people. For more information on the costs of sprawl, please see the references at the end of this lesson. Suburban land uses affecting pedestrians can be divided into three categories. First, there are individual tract subdivisions, planned as units, with a sense of order derived from the in–road systems. Access is limited to one or two points. Most are single–family residential, though some warehousing, shopping, and medical developments exhibit the same characteristics. The distinguishing characteristics are that each subdivision is a recognizable unit, planned as a whole, that can be replanned to better serve the pedestrian. The second type of land use is the linear arterial. While the roadway portion of arterials most likely was engineered, land use planning may never have occurred or may have been haphazard. However, arterials with these activities form the backbone of most suburban communities, serving both long–distance driving and local business transactions. Arterial strips often convey a sense of the community’s image or identity. While at present this image is seldom distinguishing or pleasant, it could be improved with pedestrian/bicycle–related amenities. Arterials are obvious locations for bicycle and pedestrian improvements since these roads pass most community facilities and are the only direct and relatively long through roads in the suburban community. However, most arterials have pedestrian safety and environmental problems that must be overcome. If these problems are too great, it may be possible to improve a route parallel to the arterial but one block removed. The third general type of suburban land use is bypassed land, forgotten during initial development as entrepreneurs leapfrogged out to find cheaper land. These lands infill more slowly and more haphazardly than planned subdivisions and are likely to have many owners and a variety of land uses, although perhaps not as many as along arterials. Bypassed lands may be the easiest to adapt to pedestrian– and bicycle–related improvements, as they typically have the highest densities, have mixed land uses, and are close to a variety of services. The most dangerous places for pedestrians are along suburban roads without sidewalks and intersection treatment. These roads are usually arterials located near schools, commercial areas, or businesses. Intersections of residential streets and other arterials that have no sidewalks or signals also contribute to risk. Moreover, bus stops are often located where there are no sidewalks, contributing further to pedestrian hazards. 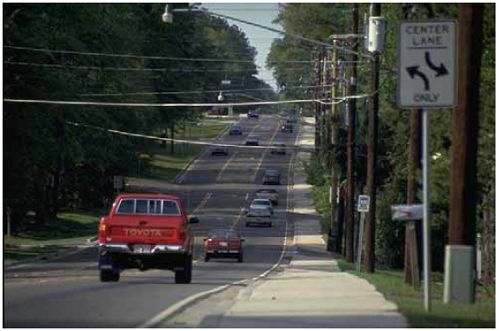 While suburbs were designed around the automobile (see figure 7–4), the car need not always be dominant and uncontrolled. Increased car use has constrained its own flexibility because roads have become more crowded and fuel costs have risen. Extending pedestrian and bicycle access within a community may eliminate some need for the car, allowing increased flexibility for those who have to drive. Walkways should be planned for physical and psychological safety from the auto, yet allow direct and easy access to all types of activities. Most walkways should be planned in conjunction with roads, so pedestrians can reach all developments that are located along the road. Figure 7–4. Unless required by local ordinance, many developments focus on vehicle access without regard to pedestrian access. Suburban areas typically consist of many small residential developments, each abutting a major road. These major roads lead to services such as shopping, schools, and parks. Pedestrian and bicycle safety problems may be less of an issue inside individual suburban developments (unless they are large), but they increase on collectors and arterials both within and adjacent to neighborhoods. Independent retrofit projects. Many suburban and urban arterials in the United States could benefit greatly from certain basic safety provisions for bicyclists and pedestrians. Examples include eliminating gaps in the sidewalk (providing sidewalks on both sides of the road), improving accessibility at intersections and driveways, using better signal technologies (such as pedestrian countdown signals, leading pedestrian intervals, and others), providing shorter crossing distances at intersections and median refuges wherever possible, improving midblock crossings, adding bike lanes and shared–use paths, and other types of improvements. Reevaluating the need to widen the road. As a long–term cost–saving measure, roadways are often widened to meet the anticipated traffic volumes two decades hence. These traffic projections are based on many assumptions that may not be realized and often result in very wide roadways built to handle far more traffic than they carry today. Communities must carefully consider the impact of extremely wide roads on other modes of transportation during the intervening years. The costs in reduced mobility may not be worth it. Road diets. Some roads have more travel lanes than necessary and are difficult to cross because of their width. Reducing the number of lanes on a multilane roadway can reduce crossing distances for pedestrians and may slow vehicle speeds. A traffic analysis should be done to determine whether the number of lanes on a roadway (many of which were built without such an analysis) is appropriate. Level–of–service analysis for intersections should not dictate the design for the entire length of roadway. For example, a four–lane undivided road can be converted to one through lane in each direction, with a center left–turn lane or raised median, and turn bays and bicycle lanes on both sides of the roadway. Turn bays may be needed only at specific locations. Depending on conditions, it may also be possible to add on–street parking while allowing for bicycle lanes on both sides of the street instead of a center turn lane. If no sidewalks exist along the roadway, these should be added. If sidewalks exist, and there is adequate room, a landscaped buffer is desirable to separate pedestrians from the travel lane. Form–based codes. As described in lesson 5, retrofitting busy roads to accommodate pedestrians and bicyclists does not stop with the roadway and sidewalks. The planner must also be concerned with the development that lies alongside the roadway. 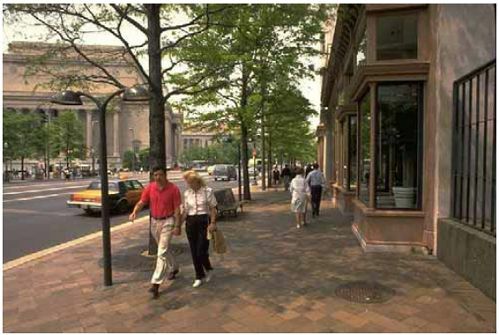 By establishing new codes that require new and redeveloped properties to be pedestrian–oriented, the street can begin to function for more than just automobile traffic. Form–based codes are one tool to accomplish this. For more information, see lesson 5. A Safe Routes to School program is a way to improve the safety of children who walk or bicycle to school and to promote these types of transportation. During a Safe Routes to School program, parents and school administrators work with other community groups and agencies to build new sidewalks, improve pedestrian crossings, teach children safer bicycling and walking skills, and promote healthier, more active lifestyles. A recent national survey found that while 70 percent of parents walked or bicycled to school as children, only 18 percent of their children walk or bike to school today. The parents listed distance, heavy traffic, fear of crime, inconvenience, as among the reasons their children do not walk. Many communities are no longer set up for the walk to school: subdivisions lack sidewalks, or are separated from school by a busy multilane arterial road. A lifestyle geared to the automobile means parents and children spend more time than ever in the car—more than an hour a day now for the average child in the United States. Millions of parents now drop the kids at school on the way to work, creating traffic jams in school parking lots. Meanwhile, many children are struggling with being overweight, and 15 percent of children are now considered obese, putting them at risk of a number of chronic diseases. There are three distinct phases in each Safe Routes to School program. In the first phase, participants generate interest and enthusiasm about the project, and identify and assemble a core group of people who will help with the project. Often, this effort includes participation in Walk to School Day (held each October), or other promotional efforts. For the second phase, a group works together and conducts outreach to identify the types of improvements and safety programs that are needed. The third phase is implementation—that is, getting projects built, putting education and encouragement programs in place, and any other activities identified to make the journey to school safer. Entrances to many commercial and retail centers are oriented toward automobile travel. Bicycle and pedestrian access to storefronts is not only difficult and awkward, but often unsafe. For the purpose of this discussion, a shopping center serves as an example of how to retrofit existing developments to accommodate pedestrians. The same principles apply to other types of developments such as office complexes and multifamily housing. A typical shopping center or strip mall is separated from the roadway by a wide parking lot that averages between 90 and 150 m (300 and 500 ft) in depth. Often, no pathways link store entrances to the sidewalks along the street, and sometimes there are no sidewalks on the street to be linked. Parking lots with multiple entryways allow traffic to circulate in different directions, creating hazards and confusion for walkers and cyclists. Drive–throughs at banks and fast–food restaurants in out–parcel developments add to pedestrian safety problems and encourage people to drive between different destinations on the site. Storefronts do little to encourage walking. 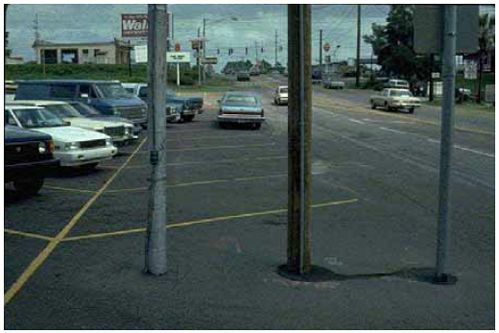 They are often barren and devoid of windows and are therefore visually unappealing to a pedestrian (see figure 7–5). If they exist, walkways between stores are often narrow and uncovered, and pedestrian amenities such as benches are rare. Pedestrian connections between developments are not provided, encouraging shoppers to get back in their automobiles to access adjacent developments. Figure 7–5. Photo. Building entrances and storefronts should be oriented to face the street. Provide comfortable transit stops and shelters with pedestrian connections to the main buildings; transit stops and pedestrian drop–offs should be located reasonably near to building entrances—preferably no more than 225 m (750 ft), and ideally much closer than that. Provide attractive pedestrian walkways between the stores and the adjacent sites. Ensure that fencing and landscaping does not create barriers to pedestrian mobility. Increase the density of existing sites by adding new retail buildings in the existing parking lots, with offices or multifamily housing around the perimeter of the site. Locate parking lots on the sides and to the rear of buildings, with major retail situated closer to the street. Rework entrances and orient buildings toward pedestrian and transit facilities instead of parking lots. Arrange buildings onsite to reduce walking distance between each building and between the nearest transit facility. Provide covered walkways around and between buildings if possible. Connect all buildings onsite to each other via attractive pedestrian walkways, with landscaping and pedestrian–scale lighting. Provide covered walkways where possible. Minimize pedestrian/auto conflicts by consolidating auto entrances into parking lots. Separate roads and parking lots from pedestrian pathways through the use of grade changes. Implement safety measures at pedestrian crossings, warning signage, tight corner radii, and other measures (see figure 7–6 and see lesson 20 on traffic calming). Figure 7–6. Photo. 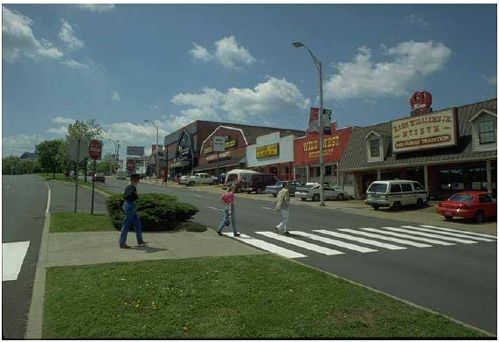 Medians and crosswalks should be placed at destination locations such as this shopping center. Describe 10 to 15 ways in which you would propose to retrofit a nearby residential development (or one that you grew up in) to make bicycling and walking viable forms of transportation. Elaborate on each idea, explaining how it would work and why it would improve the livability of the community. Ewing, R., Schmid, T., Killingsworth, R., Zlot, A., and Raudenbush, S., "Relationship Between Urban Sprawl and Physical Activity, Obesity and Morbidity, " American Journal of Health Promotion, September 2003. Oregon Transportation Rule: Recommendations for Pedestrian, Bicycle and Transit–Friendly Ordinances, Oregon Chapter of the American Planning Association, West Linn, OR,1993,. PBIC, Engineering Treatments page, available online at http://www.walkinginfo.org, accessed May 2004.